This is how frightened/unhinged some far left authoritarian globalists have become as they advocate for open interference in U.S. elections. These are also the moments when the true intent of these groups are revealed. It’s not about ‘climate change’ or ‘inclusion’ but rather about the dismantling of America from the bottom up. I was nine years old when I first seriously pondered the result of a US presidential election. It was 2000 and my father suggested we bet on who would win the 2000 vote – George W Bush or Al Gore. In the kitchen of our apartment in the Paris suburbs, I bet a piece of gum that it would be Gore. Two months later, the Supreme Court decided otherwise, and I didn’t realise until many years later how close I had come to being right. Perhaps that’s when it originated: the idea that maybe other countries shouldn’t just be left wringing their hands every four years and waiting to see who US citizens had chosen to appoint as (to speak like a White House staffer on Scandal) the leader of the Free World. And perhaps that seed of an idea continued to gestate in 2004, when we waited to find out whether John Kerry would deprive George W Bush of a second term; then in 2008, when T-shirts bearing Barack Obama’s red and blue “Hope” poster started cropping up on the streets of the French capital; and again in 2012, when we learned the names of his Republican challengers. Then, of course, came November 2016, by which time I had moved from my native France to the US. I came home from work at approximately four the morning after the election and spent an hour or two on the phone with my mother (it was mid-morning in Paris) talking about Donald Trump’s ascent to power and what it meant for America as well as for the world. …I am tired of crossing my fingers hoping that American voters will do the right thing. Let’s just cut to the core of Ms. Michallon’s stupidity. The world is more peaceful now than it ever was during the Obama years and that peace has largely been led by the U.S. and the Trump administration’s policies. Apparently, though, world peace isn’t important because Michallon doesn’t personally like President Trump. You see, her feelings are far more important than the rest of the world. The U.S. is generating less CO2 now than at any time in its history. We are leading the world in clean energy technology largely because the Trump administration has unburdened the energy producing industry from the ridiculous layers of regulations imposed upon it during the Obama years. Mr. Obama talked clean energy. President Trump is actually doing it. Ah, but again, Michallon doesn’t like how the president talks, or looks, or some other superficial reason that is far more important than clean water and clean air. The Trump economy is seeing record-setting improvements in the daily lives of nearly all Americans, but most especially minority Americans who are working and creating businesses at levels never before seen. This means less dependence upon the government of course, which Michallon apparently cannot abide. No, her words suggest, these ‘little people’ are to remain little with their hands out and their eyes begging for help from on high. Clemence Michallon and those like her would do well to clean up the mess that is their own countries. France? Really? It is a nation hobbled by governmental ineptitude at every level as are most of the European countries. Trump’s America should be the example to the world – at least a world that wants peace and prosperity and not the jackboot of centralized governmental authority. 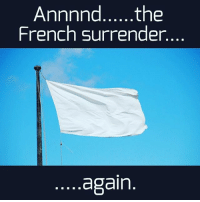 Then again, history knows well how the French react to the jackboot – namely by turning and running away and counting the days until U.S. soldiers arrive to save them.